With an historic failure rate of 66 per cent, the entry, descent and landing phase of the Mars mission is the most dangerous six minutes of the nearly two-year journey. Because the Mars surface pressure is less than one per cent of Earth’s—not enough to slow a spacecraft down—the engineering challenge is to find a way to slow the Mars lander from its entry velocity that might be in excel of of 19,000 kilometres an hour to zero impact in just six minutes. Steadily improving deceleration and landing techniques for every mission, engineers have been developing new technologies to help reduce the risks. In the Race to Mars mission detailed here, the Race to Mars crew will rely on the Gagarin, a vertical ascent/descent vehicle to land on the surface of Mars. This same vehicle will later be used to return to space and dock with the Terra Nova again. After being assembled during a docking maneuver in low Earth Orbit, the Gagarin will be sent into Mars orbit in advance of the crew’s arrival. Once the crew transit vehicle Terra Nova docks with the Gagarin, the crew boards the ascent/descent vehicle wearing their space suits for the most exhilarating and dangerous six minutes of their lives. Entry begins as the Mars ascent/descent vehicle (MADV) reaches the Martian atmosphere, about 125 km above the surface, and during entry is eveloped by incredibly hot gases. For 30 seconds, the Gagarin will be surrounded by temperatures that can exceed 1600° C. Protected by the Gagarin’s highly engineered heat shield, the crew will be unaffected by the intense temperatures. NASA engineers re-entry heat shields to withstand air temperatures in Kelvins equal to the entry speed in meters per second, with peak heat flux, heat load, peak deceleration and peak dynamic pressure taken into account. At 31 kilometres away from the surface, the maximum g-force, or acceleration due to gravity, is 1.3 g, while the maximum mach number, or relative velocity divided by the speed of sound, is Mach 12.66. Like earlier Mars missions, the lander will use several methods for rapid deceleration and dealing with the mechanics of heat-shield separation and craft alignment. Techniques include parachutes, a protective and aerodynamic bi- or tri-conic aeroshell and retro rockets. 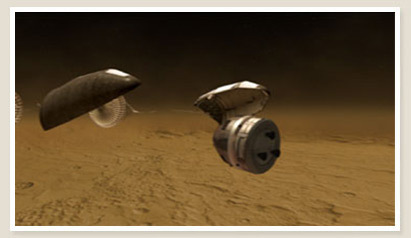 Race to Mars: Separation of aeroshell from lander. The parachute is deployed once the lander has slowed to Mach 3, which will take roughly five minutes. Then, within 20 seconds, the aeroshell will open and separate from the lander and the retro rockets will begin firing five kilometers above the surface. At this point, the lander will have slowed to Mach 2. Within another 20 seconds the lander will be one kilometer above the surface, and the vehicle will be traveling at 100 meters a second, making manual takeover possible. It will take another 20 seconds to decelerate from 100 meters a second to 0 metres a second, during which time the lander transitions to a horizontal flight above the surface. Depending on how far away the lander is from the landing site, it will travel two to four horizontal kilometers, traveling for 60 seconds. A final, 20 second, careful piloted vertical descent will bring the MADV gently to rest on the surface. 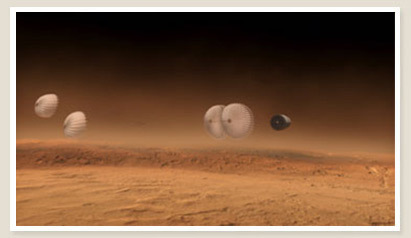 Previous Mars landings, often using airbags, have been bouncy and hard. Even if the descent is completely successful, the rapid landing speed, combined with unpredictable elements (including strong winds or storms) will mean the landing will be somewhat bumpy. With the help of advanced mapping and sensors, hazard avoidance and navigation has vastly improved compared with earlier missions. Still, the lander will be ruggedly built to tolerate small- to medium-sized rocks and gentle slopes should it veer off course, encounter bad weather conditions or encounter other hazards. According to the Race to Mars mission plan, the MADV lander will come to rest in Dao Vallis, a valley system in the northeast corner of Hellas Basin. Although it’s close to the rocky Niger Valles, 200 kilometres away, the floor of Dao Vallis is generally smooth, with eroded remnants, making it safe for landers. It stretches for over 650 kilometres in length, with canyon walls up to 2.5 kilometres high,. The generous size of the canyon means added safety, should the landing drift slightly from its precise location. Because the valley borders on the Hadriaca Patera, an inactive volcano, there will be much to explore. Past geothermal activity means that the area could be an interesting place to look for evidence of liquid water and possibly life. During their 60-day stay on the surface of Mars, the crew can seek out possible lava tubes, which may house ancient evidence of water from rain that would have fallen around the erupting volcano and either evaporated or seeped into underground caverns where it may remain in either frozen or liquid form. With the possibility of water, there may also be signs of life. Unlike previous robotic missions, in which Mars spacecraft merely had to land on Mars, the Gagarin MADV is also equipped to take its crew back into space to dock with the transit vehicle waiting in Mars orbit. 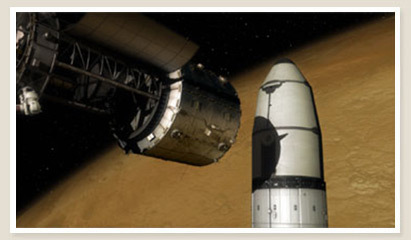 The ascent back into Mars orbit on board the MADV marks the start of the crew’s journey home. Accurately measure distance, rotation and surface topography: MOLA (Mars Orbiting Laser Altimeter) has been used to generate more accurate topography surveys on Mars than ever before. A lander equipped with LIDAR can scan the surface, detecting hazards and adjusting the precise landing site as required. Measure speed: Doppler lidars can be used to calculate wind velocity on Mars and determine its effect on the landing. Measure chemical compounds and concentrations: DIAL can be used to determine the chemical concentrations of the atmosphere in advance of the landing. Previous Previous post: Is there water on Mars?